Christmas has always been my favorite time of year. Being with family, eating decadent food, playing in the snow (the rare time we get it here in Vancouver)…these are the things I look forward to throughout the entire year. The year Sammy was born was no different. He was due at the end of November, so we were looking forward to a very special Christmas. What’s better than celebrating your favorite holiday with your sweet, one-month-old baby? Unfortunately, things didn’t quite turn out like we had imagined. As you know if you’ve spent any time on this blog, Sammy wasn’t the typical, sleepy newborn. He came out screaming, and didn’t stop. Literally, if he was awake, he was crying or screaming. At the time, my husband was working on his PhD, and we were living in student housing at the University of British Columbia. Good friends who also lived in residence had a baby the same week as us. I remember taking Sammy for a walk one day to get him to stop crying. We walked to the “Village”, a kind of mini-town on the university grounds. I ran into my friend there, who was also pushing her new baby in a stroller. After congratulating each other on our new babies and recounting our birth experiences, I remember she said something to the effect of, “Isn’t it amazing having a new baby…especially at Christmas?”. While I agreed, I distinctly remember thinking, “THIS is amazing? I’m barely hanging on here!”. Up to that point, I think I attributed many of his behaviours to the newborn stage. Our daughter, now 2.5, had colic as a baby, so I knew that not all newborns were “easy”. But when my friend described this stage as “amazing”, I knew there was something different about Sammy! 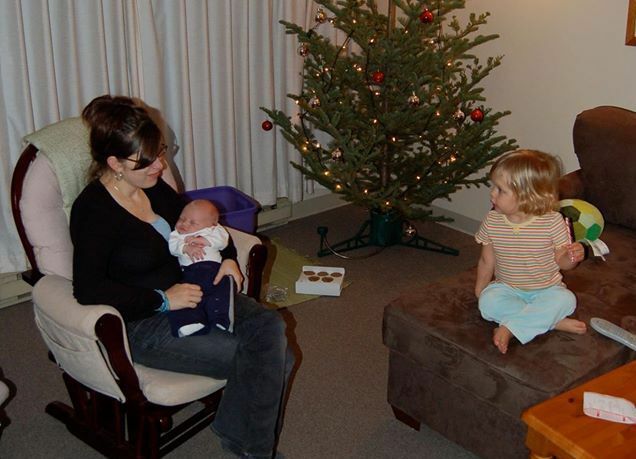 The picture above was taken about three weeks before Christmas, which means Sammy was just a week or two old. It looks peaceful enough, with our daughter sucking on a candy cane while I hold a sleeping Sammy in the rocking chair. But what you DON’T see is the story behind this picture. Decorating the tree is one of my favorite holiday events. This particular evening, we decided to give it a try, even though Sammy had been screaming constantly throughout the day. We even went to our favorite bakery to pick up some chocolate treats to eat while we decorated. We pulled out the decorations and started hanging them on the tree…and Sammy just kept screaming. I finally relented and said that my husband and daughter would have to do it this year. While they decorated, I rocked quickly in the rocking chair with my pinky in Sam’s mouth. He sucked furiously, drawing up his little knees, grunting and groaning, and letting out periodic little screams. This isn’t how rocking a baby is portrayed in the movies! The fact that I had hardly slept in the past week or two. Sammy was awake, screaming, every 45 minutes, all night long. 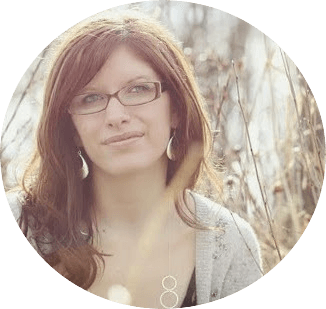 The thoughts of, “I know I should love my son, but I just don’t feel it” (and then of course, the guilt over thinking that). This was NOT how I imagined Sammy’s first Christmas. I couldn’t wait for the holidays to be over so we could stop pretending this was such a special time with our new baby. Fortunately, this was our most difficult Christmas, by far. While Sammy still wasn’t an easy toddler, he was so full of life and joy that his second Christmas (and all the ones after that) were pretty much just as I imagined them. 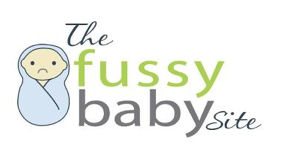 If you have a fussy or spirited child, you probably aren’t looking forward to the holidays as much as you’d like. The change in routine, long drives to visit family, missed naps and being hugged/kissed/passed around by virtual strangers just aren’t all that appealing. I’d encourage you to slow down this Christmas season, and think about what’s best for YOUR family. You know your child best, and you know what he or she can handle. If that means cancelling the long trip to grandma’s and grandpa’s this year, do it. If it means showing up for holiday functions and leaving after an hour, that’s perfectly ok. If it means wearing your high need baby in a sling so she doesn’t get passed around among strangers, go for it. There will be many Christmases in the future where you can be more flexible and can really participate in holiday activities. This year, take care of yourself and your family. Do what you feel is best, and don’t feel guilty about it. Need more info and support to help you survive (and thrive) with your high need child? It’s easy to feel overwhelmed and guilty when you have a high need or spirited child. No one ever tells you parenting can be THIS hard! 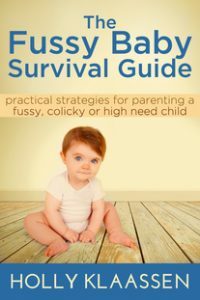 If you’re looking for practical strategies for parenting a high need child, or just reassurance that what you’re going through is normal, you might be interested in my new ebook, The Fussy Baby Survival Guide.